My panic and unease during my first pregnancy (exposed in Part 11) increased exponentially after I gave birth. I remember everyone waxing lyrical about the “joys of motherhood”, yet for at least the first eight months of my baby’s life, feeling inept, unknowledgeable and completely inadequate as a mother, my experience was more akin to the “misery of motherhood”. With a baby that screamed constantly (with colic I was told), I found myself unable to pee, shower or even get dressed without having him bring the house down. Having had a Doepmaal (Naming ceremony) that was televised and published in a local newspaper (a long story I care to leave to another time), we managed to keep him quiet long enough for the important bits. He was bedecked with yellow roses shrouded in white and looked every bit the little angel. My new life was characterised by constant screaming, to the point that I could not do normal mummy things, like shopping or walking in the park. Grocery shopping was virtually impossible, and any attempt ended up with me hightailing it out of the supermarket before someone called the welfare on me. 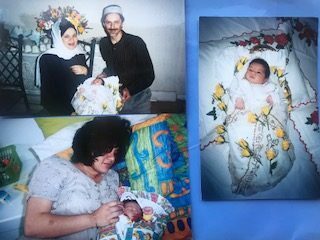 Shafiq was incredible as a father, helping wherever he could, from nappy changing to bathing, and his even temperament created somewhat of a balance in the chaos. As a husband, he was less than experienced, and we bounced off each other frequently. We had a common challenge though, which bound us in a way but at the same time put strain on us. Shafiq and I would sometimes be pacing up and down in our bedroom at 1.00 in the morning trying to calm down our screaming little son. No doctors could diagnose anything unusual and I am convinced that my baby felt my fear, my inadequacy and absolute ignorance, and it ignited within him a resistance that may have shaped some of his personality growing up. How much of it was genetic, I will never know. This little man, always seemed like an adult in an infant’s body, fighting against the restrictions of his tiny immobile physique and a clueless mother. I know that I felt constant strain and I remember one day, still in my pink spotted nightgown, having had no opportunity to shower and get dressed that day, Shafiq returned from work, happily waiting to see the baby, with a huge smile on his face and reached out to kiss me. I burst out crying yelling “Take your baby!” handed him over to his dad and ran into the bedroom weeping in self-pity. These melt-down-moments are neatly tucked away in mother-baby magazines with tips on how to handle baby blues. This, however was not baby blues. I didn’t neglect Faeeq depressively withdrawing from life. Instead I stopped living, to see to his every need, causing me insufferable angst. I didn’t embrace my pregnancy or my motherhood and even though I was a 32-year-old first-time mother, I reacted more like a teenage mom. 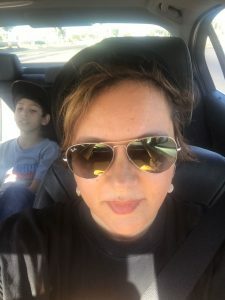 I could have embraced love in these moments, but instead I chose to focus on my own pains and woes, not even considering the pain and fears that my husband was experiencing. My mom supported me throughout my tribulations as she had always done, yet I took her for granted, as if she had no choice, but to be my mother and take care of me, even though I was now having to take care of another human being. This attitude marred my relationship with her for many years and I was embarking on the same course with my own child. I never considered anyone else and focused on my own universe as if it were the only one that mattered. No wonder my son screamed. He imbibed my selfish fears through the milk I nursed him with. He felt my anxiety and heard the tension in my voice. The love I had for this little creature was so immense, but not even my gentle touches and loving kisses were strong enough to overcome everything else I sub-consciously shoved at him. Not to mention what he must have absorbed during my troubled pregnancy. At 4 months old, after a visit to the family in Cape Town he started calming down. At 5 months old, I left him in the day care of my aunt while I returned to work with a heavy heart, commencing my practice as an advocate. By the time Faeeq was 10 months old, he walked with sturdiness. He stopped nursing from me at about 16 months old on his own accord, oddly enough, on our second annual trip to Cape Town with him. The bottles that he drank from, while I was at work were similarly put aside by him without looking back. I never had to train him or discipline him in any of these matters. Once he made up his mind about something he implemented it immediately. Potty training was equally easy. This toddler who screamed his way through the first few months of his life had something to teach me. At that stage I couldn’t see beyond my own pain and strife and could not see what I had to learn. Shafiq and I reared him with strict discipline and fear, not sure whether our approaches were right or wrong. Shafiq was more even tempered and calm, but when the need arose he took complete control. I wish with all my heart that I had tried harder to figure out what language of love Faeeq needed, but I was too busy imposing what I thought he, (and his dad for that matter) needed. I had to get this motherhood thing “right” and not fail. My assumptions took over, as my need to be in control and always be rights over-shadowed everything. I felt responsible and approached it in the organised way I did my work, and other ‘projects’ of importance. I always had baby bags super-organised for outings, food prepared and state of the art bottles, bags, bowls and baby gadgets and adorable clothes. Love and adoration cannot be planned though. Even though I felt an abundance of love for this beautiful creature that entered my life so unexpectedly, I wish I could go back and swap some of the organisation for disordered unfettered affection. I was affectionate and loving, but my command-control style as a mom often came across as bullying, sometime subtle and at other times overt. My son, now 19 years old is a continent away from me and even though I feel like a piece of me is missing, I agreed to let him spend a year in Australia, before starting university next year, God-willing. This young man has seen his own way in the Australian Outback in the rural town of Abergowrie, with no post code or amenities, living on 2-minute noodles and back-packing to Thailand and Malaysia by himself, and none of these accomplishments have anything to do with me or my mothering. I have had to forgive myself for doing the best I could as his mom. I had to acknowledge that my mom did the best she could with me. That she chose to stay and look after me and my brothers when my father left for a few years. Before you nod with approval, know that it took me many long years to fully realise these truths. They reached my head much earlier than they reached my heart. I fell pregnant 5 times with Shafiq in a seven-year period, despite the use of contraception. Three of my pregnancies resulted in beautiful children. I had spent most of my life avoiding the mammoth responsibility of motherhood. Before Shafiq, my body and mind were complicit in this avoidance, and I managed to escape the fate of pregnancy. How did I find myself as ‘the mother’? I had never been maternal except to my cats and dogs when I was little. I was devastated when my first dog Sandy was struck down by a virus before she was fully grown. I forced my brothers into mourning with me and we did prayers for her as she was buried on our back yard behind the garage. It took me a long while before I agreed to accept another dog (Bruno) that my dad got us from his friend Duggie. I also adopted an abandoned grey kitten Mishka, who slept with me, brought me dead mice and birds as gifts when she was older, and although she was friendly with Bruno, scared off any other dogs in the neighbourhood that threatened her. I lost her too. These relationships were manageable. I played a subsidiary role in their lives as they could survive independently of me. It was still difficult to see them go.